According to data from various surveys, mean vitamin E intakes in Europe were between 7.8 and 16.0 mg α-tocopherol per day (EFSA Panel on Dietetic Products N, and Allergies. EFSA J 13(7):4149, 2015). About 50% of all German men and women had a daily intake of vitamin E below the recommended value (II. NV. Max-Rubner-Institut, Karlsruhe, http://www.bmel.de/DE/Ernaehrung/GesundeErnaehrung/_Texte/NationaleVerzehrsstudie_Zusammenfassung.html, 2008). In the UK, at a recommended intake level of 3–4 mg/day, only 1–3% of the population did not meet national recommendations for vitamin E set in 1991. However, more recent recommendations of 12 mg/day would not be met by between 64 and 75% of the population (Statistics UKOfN. The National Diet & Nutrition Survey (NDNS): adults aged 19 to 64 years, 2003). Marginal intake of vitamin E is relatively common in the USA: The National Health and Nutrition Examination Survey III (NHANES III, 1988–1994) examined the dietary intake and blood levels of α-tocopherol in 16,295 adults over the age of 18 years. Twenty-seven percent of white participants, 41% of African Americans, 28% of Mexican Americans, and 32% of the other participants were found to have blood levels of α-tocopherol less than 20 μmol/L (Ford and Sowell. Am J Epidemiol 150(3):290–300, 1999). Later on, data from 1999–2000 showed that mean dietary intake of α-tocopherol was 6.3 mg/day and 7.8 mg/day for US women and men, respectively (Ahuja et al. Ann N Y Acad Sci 1031:387–90, 2004). These intakes were well below the current intake recommendations of 15 mg/day. In fact, in recent publications it has been estimated that more than 90% of Americans do not meet the daily dietary recommendations for vitamin E (Fulgoni et al. J Nutr 141(10):1847–54, 2011). 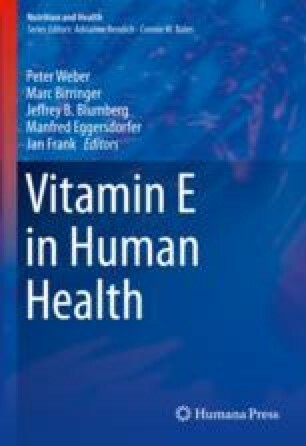 Most recently, a comprehensive review of vitamin E dietary intake and blood serum levels demonstrated that the majority of reported intake values worldwide were below the recommended level. Globally, 82% of the vitamin E intakes were below 15 mg/day; this ratio was 91% in North and South America, 79% in the Asia-Pacific region, and 80% in Europe. Regarding serum concentrations, globally 13% of the included data points were below the functional deficiency threshold concentration of 12 μmol/L. Of the reported study populations and subpopulations, only 21% reached the desirable threshold of ≥30 μmol/L serum α-tocopherol concentration globally (Peter et al. Int J Vitam Nutr Res 2016:1–21, 2016). Peter S, Friedel A, Roos FF, Wyss A, Eggersdorfer M, Hoffmann K, et al. A systematic review of global alpha-tocopherol status as assessed by nutritional intake levels and blood serum concentrations. Int J Vitam Nutr Res. 2016:1–21. https://doi.org/10.1024/0300-9831/a000281.